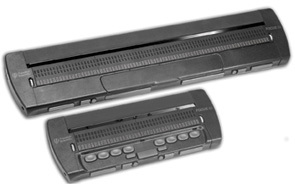 The Focus refreshable braille displays give you unequalled user control. The latest in braille display technology, the portable and affordable Focus 40 and 80 put you in control as you smoothly navigate the Windows® environment. The Focus 40 is packed with advanced features and options that can be easily configured through JAWS® for Windows. Connection is simple. Just plug into a PC or notebook computer via USB. The Focus has been specifically designed for comfort and ease of use. The surface of the braille display has a design that eliminates seams between the cells, and provides a smooth reading surface that feels like paper. Front panel select buttons can be used in combination with panning buttons, rocker bars, and cursor router keys to select a block of text, page up or down, or move to the beginning or end of a document.